Constellation Technology performs complete Metrology services. Our world class inspection laboratory provides accurate and precise measurements. The analysis is provided in a responsive, timely, and competitive manner. 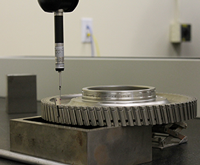 Precise measurement equipment, such as Coordinate Measuring Machines (CMM), are utilized to discriminate within 10 percent of the total tolerance spread for the feature being inspected. Compliance with specifications, drawings, etc.